V.com weekend vote: Do you play the viola? March 2, 2018, 10:46 AM · When it comes to playing the viola, the multi-talented musician Julian Rachlin said in a 2015 interview with Violinist.com: "It's something I can recommend to every violinist." Rachlin's teacher, Pinchas Zukerman got him started with the viola, and Rachlin continued the tradition: "All my students play both instruments....I saw the difference it made for my violin playing, and for my growth as a musician, to play the viola, and especially to discover chamber music from the viola part." This leads me to our vote of the week: Do you play the viola? Personally, I don't play the viola, though I made a small step in that direction by getting a five-string electric fiddle that happens to have a C string. But let's face it: that's not the same thing, and I don't claim to play the viola! I greatly admire my switch-hitter colleagues who can play one concert in the violin section and then the next one with the violas! Bravo! Love this picture from the 2014 Primrose Festival: Eun Hwan Bai holds both his viola and his violin! And then there are those with full dedication to the lower tones of the viola, who have taken the jokes in stride and continue to create that rich sound that, along with the cello, forms the basis for good string sound in any ensemble. What is your experience with viola-playing? Do you play the viola at all? If so, do you regularly play both instruments, or do you lean toward one or the other? Or are you pretty much dedicated to just the violin or just the viola? Please answer the question in the vote and then share your viola thoughts and experiences. March 2, 2018 at 06:36 PM · Violin only. You know, to this day, I don't recall ever picking up a viola. I can read the C-clef, somewhat, thanks to reading orchestral scores. Whatever -- I love the sound of a viola. If only I didn't already have three fiddles that I play on each day, I might have time for viola. Who knows? It might happen yet. I've found a couple of D-G string combos that make one of my instruments sound like a viola when I play it in the contralto range. For now, this is how I get my viola "fix." One viola effect I find catchy: The instrument can sound, to me, a bit like the chirping of a bullfrog -- when the violist plays short, incisive figures on the C string, stopping the bow intermittently. March 2, 2018 at 07:29 PM · The day I started learning violin, I knew I wanted to switch to viola as soon as I could. The only reason I started on violin was that there was a violin that had sat unplayed at my uncle's house since before I was born, and it was offered to me for free. I switched a year and a half later, when I went to college. Since then, I've played violin very little, except for one year in which I got bumped from viola to violin in an orchestra (it had 16 violinists and 15 violists before violists were asked to switch to violin)... I played my violin for the first time in over a year yesterday, and it felt like a toy. March 2, 2018 at 07:37 PM · I play primarily violin, but teach violin and viola. I enjoy learning the viola repertoire and love that violist can play both the Bach violin solo sonatas and the cello suites! March 2, 2018 at 07:52 PM · I started playing viola a few years ago due to being unexpectedly assigned the viola part as a violinist in a chamber music program. I had never done chamber music before that happened. In that program, it was not uncommon for violinists to be assigned the viola part due to a severe shortage of violists. I could've played the viola part on violin. However, my teacher said that it would sound better on viola because I wouldn't have to move the C string notes up. When I got the news that I would be getting a viola (a restrung violin due to my size), I had an absolute meltdown, saying "Why do I have to play a viola? It'll sound just fine on a violin." Well, everybody pushed me and forced to play viola, and I'm so glad that I was pushed/forced because ever since I got my hands on the C string, I fell in pure love with it. A year later, I started playing in orchestra on viola. I had never played in an orchestra before in my life. I've been playing viola in chamber music and orchestra ever since I started playing viola. Now, I want to try chamber music on violin or piano and orchestra on violin because I haven't really done it before on these instruments. Currently, I play viola in chamber music and orchestra, as well as a few gigs. I don't take viola lessons, but I enjoy teaching myself solo repertoire and improvising just to keep myself motivated (my violin teacher is extremely supportive of my passion for the viola) because chamber and orchestra parts don't sound good solo. At this point, violin is my primary study while viola is mostly a "for fun" instrument with which I just want to meet my own expectations and have fun with. I want to study violin and not viola at least until high school grad (may go into music college) because the commonly-played violin repertoire utilises more extended techniques and virtuosic stuff (really interested in that stuff) than the commonly-played viola repertoire, although there is insane difficult viola lit out there (rarely played). I'd say that I'm about equally active playing both instruments these days. I'm hoping to get a real viola soon, since I actually think I'm big enough, now that I use a 4/4 violin. It's just a matter of getting my hands on one. Plus, I have really enjoyed playing with my restrung violin. At the community music school I attend, one violin/viola teacher, who's primarily a violist, doesn't let his students play both. I find it totally ridiculous because the decision to play one or the other or both is ultimately up to the student. Plus, being unable to play both may take away from some people's enjoyment. My goal is to play both violin and viola around equally in terms of activity, as well as piano. March 3, 2018 at 12:28 AM · There are orchestras in town that need violas desperately, so I bought one, and I play. I'm not as good on the viola -- it's bigger and more difficult to play -- but the parts are easier too, very little that goes beyond, say, 5th position. March 3, 2018 at 12:53 AM · Every time I play my violin, I find myself missing the C string desperately. The violin is nimbler, but the viola is more satisfying. It resonates against the heart. Solo and Ensemble. Sure, that the violas may not always get the melodies or the hardest parts in music but you know what, we are a crucial part in making an Ensemble, complete. Everyone is. It just takes hard work and dedication and you can make It father then you ever thought you could! 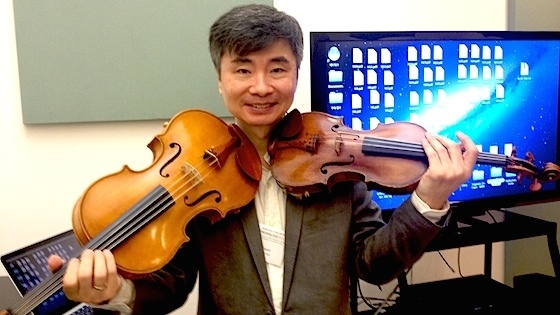 March 3, 2018 at 03:43 AM · Why is the un-standardized viola size a good thing? March 3, 2018 at 03:54 AM · I started on viola in 6th grade - the year the district started an orchestra program. My sophomore year we all moved to a new high school and there were only 2 incoming freshman violinists, about 6 or 7 viola and several cellos. It was time for me to move up in viola size, but I was tired of the awful viola parts in much of the school music so moved to violin. I play mostly violin right now because of who I play with and what I play, however, I also play quite a bit of viola and I teach both. I like playing both, but the days I do play or teach both, I have to keep reminding myself which instrument I am using. I used to play with a chamber group of strings and I would play whichever instrument was needed for a particular concert - I enjoyed having the chance to play both. I will also take my violin and viola to fiddle camp (not just for fiddlers) in Colorado the end of July where I will have the chance to play viola or violin as needed in the quartet or chamber orchestra class. Viva Viola and Violin. March 3, 2018 at 07:52 AM · Violin and ... cello for me ?? March 3, 2018 at 09:04 AM · I can't vote in this survey because I play viola...and cello. I used to play violin but have stopped ?? March 3, 2018 at 02:22 PM · I don't play the viola - never even handled one in fact - but my wife has suggested it would be a useful instrument for me to play in my English folk dance band, to give more depth to the sound, and there's no score reading involved because we play the music by ear. So a possibility there - and I wouldn't have to learn the viola C clef which is confusingly similar, but not identical, to the cello's C clef (I am a cello-less former cellist). I could also return to playing the Bach cello suites on the viola, which has the cello's ADGC tuning an octave higher; but strictly within the privacy of my own home. March 3, 2018 at 03:42 PM · Started on violin in fourth grade and switched to viola in 6th grade. No particular reason other than I didn't want to play violin anymore. I've played viola ever since (decades! ), with no interest to ever play violin again. I was asked to try to fill in for a violinist in my chamber group at one rehearsal and the violin felt like a toy. I am much smaller than most violists (under 5'2) but I made the adjustment years ago. Love the rich, deep, dark tone of the viola. Love the viola- end of story! March 3, 2018 at 06:37 PM · I got a fairly nice viola from my aunt a few years ago--she had played viola for years but as she aged was finding it too hard on her neck and shoulders to hold it. I play mainly Scottish fiddle and thought this would be a nice change, and I love the darker sound. Unfortunately I have since gotten much busier with gigs on the fiddle and haven't had as much time as I'd like to give the viola the attention it deserves! March 3, 2018 at 07:24 PM · I play violin for many years and still do. Now in all the orchestras I play viola. I also have picked up the cello. I enjoy and LOVE all three. It is great to know all the clefs. I have to agree with another response of that viola tends to be easier and not as many players. That is why I ended up changing. Still learning since I have only really consistently played for about a year and a half. Fun! March 3, 2018 at 09:29 PM · Wanted to add to my comment above: I definitely didn't choose viola because it was easier or because it was fewer players. The Walton viola concerto was the first string concerto I ever heard -- before I heard anything for violin, even! So I chose viola from the beginning (but started on violin because I could get a violin for free) and the Walton concerto, just as hard as any violin concerto out there, was my long-term goal from the beginning. March 3, 2018 at 11:12 PM · Given how this poll is falling out ~ numbers-wise ~ this website might suitably be renamed violist.com. March 4, 2018 at 02:16 PM · Both of my viola teachers ~ one who was a student of William Primrose and the other a student of Joseph DePasquale ~ convinced me that the viola is much more difficult to learn than the violin, and that learning the violin would be much easier after I built my viola technique. I believe they were correct. The viola is so much less forgiving on intonation, quality and color of vibrato, use of the bow, and how you manage your body, which must be open, very relaxed and comfortable to avoid pain. If given a choice again, I would have started on viola, then (if still interested) developed my violin technique. March 4, 2018 at 04:54 PM · While most of my musical life was as violist, as I mature, I began on vln, & now both physical limits and repertoire curiosity now have me pretty much 50/50. It is a transition made more practical b/c I play a relatively small vla w/ a lovely sound and a long-pattern vln w/ a voice. That makes most adjustments happen w/ right arm -- my more flexible one. March 4, 2018 at 09:40 PM · I agree that there's quite a viola presence on violinist.com, but most discussion is violin-related (or both), not viola-related. I agree that one must be more careful with body use while playing viola due to the larger size, as well as the fact that getting a big sound out of a viola is more work than violin. However, I still think it's wise to start on violin and then transition to viola later if you want, especially young children, due to the fact that viola is less accessible for little kids than violin (or cello for that matter). Sure, there's workarounds to get a really young kid started on viola. It's just that maybe it'll be more difficult to find a suitable teacher. March 5, 2018 at 03:50 AM · I play primarily violin and a little bit of viola. Years ago a friend handed me a viola to try playing, and I was hooked from the start. I love the deep, resonant sound, which also seems to me more earth based than the violin. I believe that the viola is at its best in the role of bringing together the sounds of various other instruments. This is its great appeal in orchestra and chamber music. I love to play my viola when I jam with a bluegrass band, where it melds together the sounds of different instruments. Besides, I love to improvise and all playing of bluegrass music is by ear. That's a wonderful excuse to avoid learning to read C clef. I also love to improvise harmony with someone playing the violin. I love to hear someone say, "It's really unusual to hear someone play a viola at a bluegrass jam." The disadvantage of the viola is that it feels very large and heavy after playing the violin almost all my life. I am now having trouble with neck and shoulder pain and I am playing only my violin for a while. I am taking physical therapy, which helps a lot, and I hope to be able to return to playing my viola soon. March 5, 2018 at 04:36 AM · I started out on violin but switched to viola after my violin teacher died--it was the right time to try it and I got hooked. I still plan to pick up the violin again but right now don't have enough practice time to do justice to both. @Trevor--I wish I had more time to practice playing by ear. Then I'd rejoin our local Scottish fiddle group with the viola. March 5, 2018 at 04:40 AM · To the person who commented on the number of violists in this survey--we're simply an enthusiastic and vocal bunch. The director of a local orchestra who is a violist once commented about growing up under the "benign tyranny of the violinists". March 5, 2018 at 05:10 AM · As a violinist who really enjoys the timbre of the viola I was happy to have exciting viola jobs that took me on a tour to Mexico and even to far north to Yellowknife Nunavut,Canada. In chamber music or orchestras it is fascinating to get different perspectives by sitting in different sections. March 5, 2018 at 10:48 AM · I play both, but just make violas. Rachlin is such a nice player and guy, I met him some months ago, and he sent me such a kind letter! March 5, 2018 at 04:10 PM · Violin is my first instrument chronologically and a few years ago I would have answered primarily violin with a little viola. Now that's reversed. I'm playing mostly viola, both in orchestras and chamber groups. I feel more comfortable and confident on the viola, even in solo repertoire. I never really liked the very high stuff on the E-string and I don't miss the "gerbil zone". But I still enjoy playing violin chamber music parts and fiddle music on the violin. I am quite happy to have the flexibility to play both. It gives me opportunities to play many different kinds of music! March 5, 2018 at 04:33 PM · Does mandola count? I've had a 1920's Gibson since the eighties, and enjoy playing it more than mandolin for the variety of reasons others have stated. March 5, 2018 at 07:19 PM · I have never attempted to play viola. As I understand it violists are more in demand than violinists.For this reason some people I know have taken it up to assure they have gigs to play. Viola seems to get a bad rap much like the drummer in a rock band.The jokes are probably about equal there. In reality many ensembles wouldn't sound half as good without one. March 5, 2018 at 07:45 PM · Depending on regional circumstances, violists are not always in more demand than violinists, especially at the professional level. March 6, 2018 at 03:13 PM · And where do you get that sort of data, Ella? I'd like to perform more analysis, since that is so interesting! Thanks for that contribution. March 6, 2018 at 10:03 PM · I've come across a lot of professional violists on the Internet, as well as comments like "competition is fierce for pro violists" and "there is no shortage of good violists", as well as comparing the circumstances in my particular region with the data I've collected from research. Where I live, there seems to be quite a shortage of student/amateur violists, there seems to be enough to fill the full-time seats in local orchestras though there's way more pro violinists than violists. March 7, 2018 at 12:29 AM · Sounds like you've done some useful data gathering, Ella, with your research. Will your results be published soon? Thanks for your contributions! Picking up the violin after several days of concentrated viola work is strange - the violin feels so tiny! It's fun to hand my viola to a violinist and have him or her draw the bow across the open C string. The look on their faces is amazing! "Come to the dark side..."
March 7, 2018 at 05:30 AM · No. I'm not publishing them anywhere. I'm just putting it out because it was brought up. March 9, 2018 at 05:28 PM · I only play violin (and mandolin) and never touched a viola until about 55 years after starting with my first violin. I chose the violin because kids in my school could only start strings in 4th grade and my father played viola when he was young. I had to be different.